Sean Carroll is a theoretical physicist at the California Institute of Technologies. He has also dedicated a considerable amount of time to science popularization through his books, such as From Eternity to Here and The Particle at the End of the Universe, and debates, for example with theologian William Lane Craig. 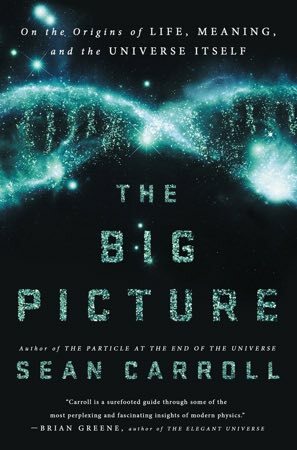 Carroll’s latest book is The Big Picture: On the Origins of Life, Meaning and the Universe Itself. Published by Dutton, the book came out in May 2016. With that title, it’s right to assume that Carroll covered many topics in the book. A look at the table of contents finds six parts, with topics such as “The Funda­mental Nature of Real­ity,” “Interpreting Quan­­tum Mechanics,” and “The Origin and Pur­pose of Life.” But in short, the book is about poetic naturalism. And what is the natural world made of? Our deepest understanding of reality, or in other words, our fundamental ontology is The Core Theory, a better term coined by physicist Nobel Prize winner Frank Wilczek for the Standard Model of particle physics. “It’s the quantum field theory of the quarks, electrons, neutrinos, all the families of fermions, electromagnetism, gravity, the nuclear forces, and the Higgs,” Carroll explains. So on our most fundamental level we have a sparse ontology, containing several different entities. The Core Theory also tells us something very im­portant about the world: there is no such thing as astrology and life after death. Carroll had written about this on his blog,1 and he repeats this spectacular argument again in the book. Using our fundamental ontology, the world, including our bodies, is made of particles interacting according to equations of the Core Theory. The important point here is what kind of particles is the soul made of? If souls are made of the same ordinary particles as human bodies, there is no afterlife. On the other hand, if they are made of a different particle, this certainly would require a new physics to describe the interaction between our bodies—collections of ordinary Core Theory particles—with the soul. But every experiment ever performed says the Core Theory provides the correct description of how its particles behave at everyday energies. We know it’s not a complete description of everything that exists in the world—for example, dark matter is not included in it—but it describes everything related to human beings. If it exists, an immaterial soul that interacts with our bodies would prove the Core Theory is not right at everyday energies; the Core Theory would then need to be modified to include how its particles interact with the soul. One cannot believe in the existence of the soul and also believe the Core Theory is the correct description of how particles behave at everyday energies. “There is no life after death. We each have a finite time as living creatures, and when it’s over, it’s over.” Carroll blows the hope for the soul away. The same line of reasoning can be applied to astrology. The Core Theory particles make human beings interact with a few forces of nature: gravity, electromagnetism, and strong and weak nuclear forces. But the nuclear forces do not reach macroscopic scales, and gravity is too weak—gravitational force from other planets might be equivalent or even weaker than that of a person nearby. We’re left with electromagnetism, but it’s not difficult to think that any electromagnetic signal coming from other planets will be interfered with signals originated here on Earth. This brings another important question: What about things that are not part of the Core Theory? Are they just illusions? No! These can be useful ideas to describe real phenomena that manifest at higher scales. Temperature and entropy, for example, are not part of our fundamental ontology, but they’re real; they are emergent phenomena. Within poetic naturalism we can distinguish among three different kinds of stories we can tell about the world. There is the deepest, most fundamental description we can imagine—the whole universe, exactly described in every microscopic detail. Modern science doesn’t know what that description actually is right now, but we presume that there at least is such an underlying reality. Then there are “emergent” or “effective” descriptions, valid within some limited domain. That’s where we talk about ships and people, macroscopic collections of stuff that we group into individual entities as part of this higher level vocabulary. Finally, there are values: concepts of right and wrong, purpose and duty, or beauty and ugliness. Unlike higher level scientific descriptions, these are not determined by the scientific goal of fitting the data. We have other goals: we want to be good people, get along with others, and find meaning in our lives. Figuring out the best way to talk about the world is an important part of working toward those goals. To conclude, it’s a great book, covering a wide range of interesting topics. In fact, it’s impossible to fairly account for all the good stuff in the book in a short review like this. Go read it!